Celery Root makes a delectable, light and airy, puree, one tasting exactly like celery, but without any strings attached, so to speak. The root vegetable can be off-putting because of its thick, wrinkly, outer skin, but considering the amount of time the root spends underground, the thickness and gnarliness makes sense. It is easy to remove the skin using a sharp chef's knife, peeling it as you would a grapefruit or cantaloupe - should the urge strike you to peel one of those fruits. Cut away the thick skin, dice the root and then simmer it in almond milk until tender. After pureeing the veggie, it is necessary to pass it though a fine mesh strainer to remove the parts of the skin that your knife will miss cutting out; the root is very wrinkly and the folds of the skin are everywhere. Once you have tackled the peeling, pureeing and straining, it is clear sailing. You can allow the puree to cool and reheat it with no problem, given that there is no starch to gum up your gorgeous velvety puree, unlike with a potato. I served this unique puree with Cajun Tofu because the spiciness of the seasonings was wonderfully foiled by the subtlety and sweetness of the celeriac. 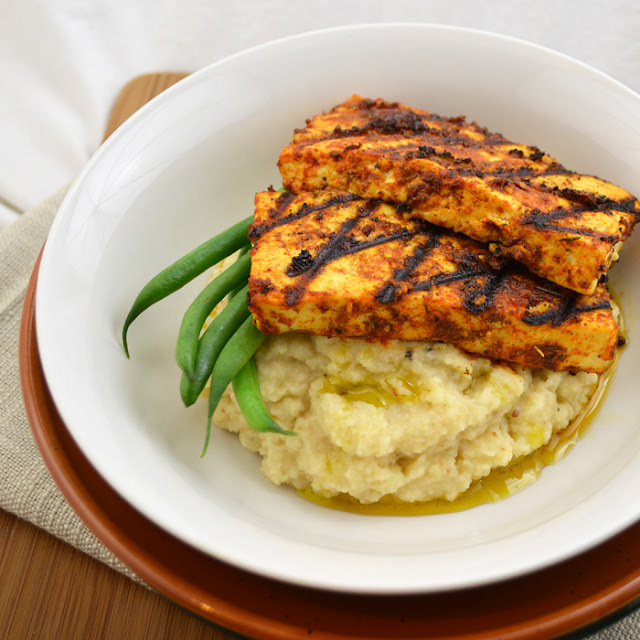 Adding a bit of olive oil on top of the grilled tofu allows the flavors of the spices to meld with the puree and gives the dish that needed richness that one expects from a dish that uses Celery Root Puree. We must have missed each other by minutes. I posted it right after you commented. It is below the "Cost Breakdown." Thanks for visiting! I made both last night, and have to say, what an awesome combo! Normally, celery root and I are best kept apart. However, having the puree as a base for the spicy and smokey tofu is genius and works very well. The only change made was the use of coconut milk (light) as all the others in the house had sweetener. Now you are being way too kind using words like "genius." Happy, happy you liked it! Especially trying it as is, with the celery root puree. I find celeriac can be a little too sweet sometimes, so I was worried about it tasting too much of that. Thank you for the feedback, as always! !